Heat oven to 350°F. Grease and flour bottoms only of two 8x4-inch loaf pans. In large bowl, beat cake mix, dry pudding mix, water, oil and eggs with electric mixer on medium speed 2 minutes, scraping bowl occasionally. Stir in 1/4 cup of the sprinkles. Divide batter evenly between pans. Bake 45 to 50 minutes or until toothpick inserted in center comes out clean. Cool 10 minutes; run metal spatula around edge of loaves to loosen. Remove from pans to cooling rack. Cool completely, about 1 hour. Spread frosting on tops of loaves; sprinkle with remaining sprinkles. When ready to serve, cut into slices. For success in this recipe, pudding mix is added dry to the cake mix mixture. 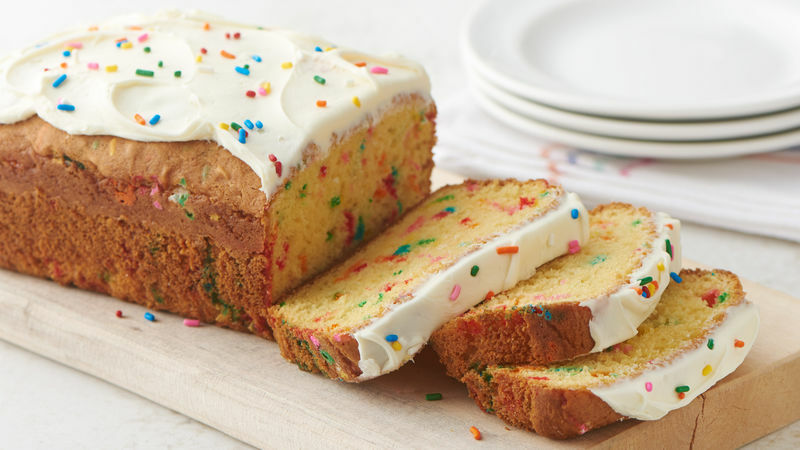 Customize this cake-mix bread for any occasion by using other colors of sprinkles.